Samuel Smiles: biographer of the Stephensons and creator of "Self-Help"
Smiles was born in Haddington on 23 December 1804 and died in Kensington on 16 April 1904. He trained as a medical doctor and actually practiced from 1832 to 1838. He the took up editorial work and became assistant secretary to the Leeds & Thirsk Railway. He then became Secretary of the South Eastern Railway. He met George Stephenson for the first time at the opening of the North Midland Railway. He was the author of several books, notably Self-help and Lives of the engineers As a young man he was a radical, but gradually moved to the right (he was a Unionist on the Irish issue) and was an advocate of public libraries. He is the subject of an entry in the ODNB by H.C.G. Matthews (biographer of over 700 entries, including George V and George VI). Jack Simmons gave a sympathetic pen portrait of Samuel Smiles in the Oxford Companion to British Railway history. 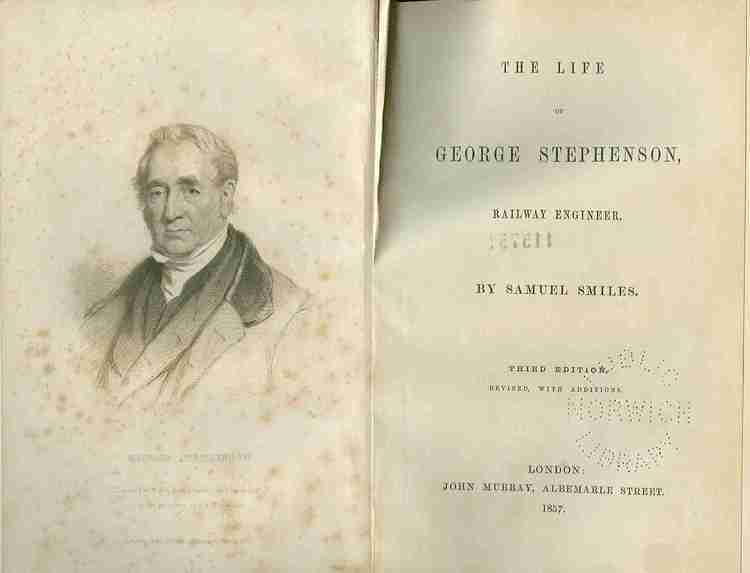 He described his life of George Stephenson as "an honest and careful book" and fully justified its original enthusiastic reception. From 31 May to 7 December 2008 the Scottish National Portrait Gallery in conjunction with the National Library of Scotland ran an exhibition on Smiles entitled Heroes: 19th century self-help role models. The exhibition was well-staged, but was absurd in that Smiles' literature was displayed in unopened volumes in exhibition cases, and there was no literature, traditional or electronic, produced to support the exhibition (which did have excellent display panels and many interesting artefacts). Extract pp. 306-08: Mr. Stephenson did not rest satisfied with the success he had achieved in the constructiolf of the "Rocket." He regarded it only in the light of a successful experiment; and every succeeding engine which he placed upon the line exhibited some improvement upon its predecessors. The engines were varied in their form, in their arrangement, in their weight and proportions, as the experience of each successive day, or week, or month suggested. No sooner were defects made apparent than steps were taken to remedy them; and each quarter produced engines of such increased power and efficiency, that their predecessors were abandoned; not because they were worn out, but because they had been outstripped in the rapid march of improvement. The "Planet" engine embodied most of the improvements made by Mr. Stephenson and his son between the construction of the" Rocket" and the opening of the railway on the 15th of September. The "Planet" was in the Mersey, but not landed, on that day. This engine exhibited in one combination nearly all the improvements which the inventors had by this time effected,  the blast pipe, the tubular boiler, the horizontal cylinders inside the smoke-box (a great improvement on the "Rocket"), and the cranked axle, together with a fire-box firmly fixed to the boiler. In the "Rocket" the fire-box was only screwed against the boiler, allowing a considerable leakage of air which had not passed through the fire. The tubes and furnace of the "Planet" gave a heating surface of 407 ¼ feet. The cylinder was 11 inches in diameter, with a 16-inch stroke; the boiler was 6½ feet long, by 3 feet in diameter; the four wheels were 5 and 3 feet in diameter respectively. On the 4th of December, the "Planet" took the first load of merchandise from Liverpool to Manchester, consisting of 18 waggon-loads of cotton, 200 barrels of flour, 63 sacks of oatmeal, and 34 sacks of malt. The total load, exclusive of the engine, was 80 tons, and it was taken to Manchester, in the face of a strong, adverse wind, in two hours and thirtynine minutes, which was considered an exceedingly successful trip. Previous to this, however, the speed of the "Planet" had been tested in bringing up a cargo of voters from Manchester to LiverpooJ, on the occasion of the contested election there, when she performed the journey between the two places in sixty minutes. The next important improvement in the locomotive was made in the "Samson," which was placed upon the line about the beginning of 1831. In this engine the plan of coupling the fore and hind wheels of the engine was adopted; by which means the adhesion of 'the wheels on the rails was more effectually secured, and thus the hauling force of the locomotive was made more available. This mode of coupling the wheels was found to be a great improvement, and it has since been adopted in all engines constructed for drawing heavy loads, where power is of greater consequence than speed. On the 25th of February, the "Samson" drew a train of thirty waggons, weighing 151 tons exclusive of the weight of the tender, between Liverpool and Manchester, at the rate of about twenty miles an hour on the level parts of the railway. In this engine the blast, the tubes, and furnace were so contrived, that the consumption of coke was reduced to only about one-third of a pound per ton per mile. The rapid progress thus made will show that Mr. Stephenson's inventive faculties were kept fully on the stretch; but his labours were amply repaid by the result. He was, doubtless, to some extent stimulated by the number of competitors who about the same time appeared as improvers of the locomotive engine. Of these the most prominent were the Messrs. Braithwaite and Ericsson, whose engine, the "Novelty," had excited such high expectations at the Rainhill competition. The directors of the railway, desirous of giving all parties a fair chance, ordered from those makers two engines on the same model; but their performances not proving satisfactory, they were finally withdrawn. One of them slipped off the rails near the Sankey viaduct, and was nearly thrown over the embankment. Their chief defect consisted in their inability to keep up a sufficient supply of steam for regular work; the steam-blast not being adopted in the engines. Indeed the superiority of Mr. Stephenson's locomotives over all others that had yet been tried, induced the directors of the railway to require that the engines supplied to them by other builders should be constructed after the same model. It is now an invariable practice with railway companies to determine the kind of locomotive with which they are to be supplied by contractors; but in those days it was positively made a ground of complaint, against both the company and the engineer, that this salutary precaution was adopted. Stephenson said, "It won't do; it's only a gimcrack." Engineers of distinction said he was prejudiced, and that he looked upon the locomotive as a pet child of his own. "Wait a little," he replied, "and you will see that I am right." Mr. BruneI approved of the atmospheric system; and had not his invention of the broad gauge proved him to be a man of genius? Mr. Cubitt, Mr. Vignolles, and Mr. James Walker, also men of great eminence, Dr. Lardner, and many others equally distinguished, as well as the Council of the Institute of Civil Engineers, approved of the atmospheric railway; and therefore it was becoming pretty clear that the locomotive system was about to be snuffed out. "Not so fast," said Mr. Stephenson. "Let us wait to see if it will pay." He never believed it would. It was ingenious, clever, scientific, and all that; but railways were commercial enterprises, not toys; and if the atmospheric railway could not work to a profit, it would not do. Considered in this light, he even went so far as to call it " a great humbug." No one can say that the atmospheric railway had not a fair trial. The Government engineer, General Pasley, did for it what had never been done for the locomotive  he reported in its favour, whereas a former Government engineer, Mr. Telford, had inferentialIy reported against the use of locomotive power on railways. The House of Commons had reported in favour of the use of the steam-engine on common roads; and yet the railway locomotive had vitality enough in it to live through all. "Nothing will beat it," said George Stephenson, "for efficiency in all weathers, for economy in drawing loads of average weight, and for power and speed as occasion may require." The atmospheric system was fairly and fully tried, and it was found wanting. It was admitted to be an exceedingly elegant mode of applying power; its devices were very skilful, and its meqhanism was most ingenious. But it was costly, irregular in action, and, consequently, not to be depended upon. At best, it was but a modification of the stationary-engine system, which experience had proved to be so expensive that it was gradually being abandoned in favour of locomotive power. In fact, Mr. Stephenson's first verdict, "It won't do," proved correct; and, by the end of 1848, the whole of the atmospheric tubes were pulled upincluding Mr. BruneI's immense tube on the South Devon Railwayto make room for the locomotive engine. Jarvis, Adrian. Samuel Smiles and the construction of Victorian values. 1997. This forms an important commentary upon the life and work of Samuel Smiles which includes an assessment of Smiles' biographies of George and Robert Stephenson, and the extent to which the former was an "unjustifiable hagiography". At the beginning of Chapter 2 there is a sympathetic assessment of the extent to which L.T.C. Rolt was influencd by Smiles' writings, again this reflects upon later interpretations of the greatness of the two Stephensons. Jarvis is important in that he corrects the assertion that Smiles had nothing whatsoever to say about the Brunels as he cites an extended review entitled 'The Brunels' (Quarterly Review, 1862 (112) 1-39) by Smiles of R. Beamish's Memoir of the life of Sir Marc Isambard Brunel. London, 1862.